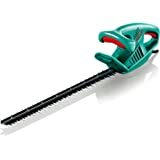 Bosch AHM 38G Lawn Mower is fast, convenient mowing of small lawn areas. The shear-cutting principle for high cut quality. "Click" locking mechanism for the tool-free setting of the bottom blade. 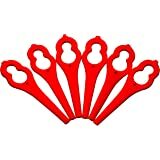 Cylinder cut system with 5 curved blades made from hardened steel. 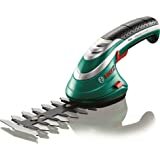 Variable height-of-cut adjustment and a cutting width of 38 cm. Simple bottom blade adjustment with "click" locking system. Maintenance free cutting cylinder on ball bearings. The easy-to-use bar for better ergonomics. Convenient pushing thanks to the special underset of the wheels. The Bosch AHM 38 G Lawnmower is designed for clean and precise cuts, suitable for small lawn areas. 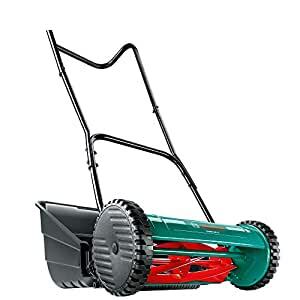 The horizontally mounted cylinder of blades cut against a fixed bottom blade, with high geared side wheels that make it easy to manoeuvre and gives complete freedom to use the lawnmower anywhere. With a 25 L grassbox it means less time is spent emptying and more time can be spend gardening. 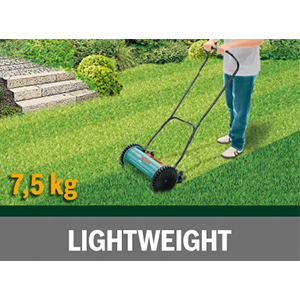 The AHM 38 G is lightweight at only 7.5 kg meaning it is easy to move around the garden. With a 25 L grassbox for allowing less time to be spent emptying and more time can be spend gardening. 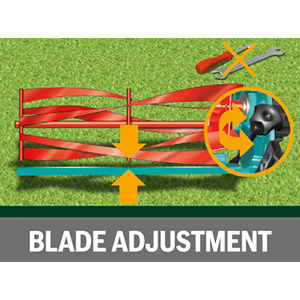 The horizontally mounted cylinder of blades cut against a fixed bottom blade for a scissor-like cut. Due to high geared side wheels its easy to push and gives complete freedom to use the lawnmower anywhere freely. 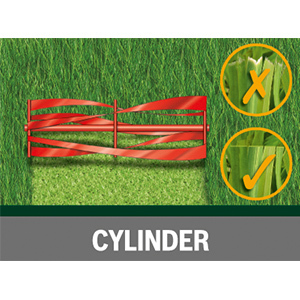 With the rear roller you can gain stripes over your lawn and importantly it offers stability up to lawn edges. 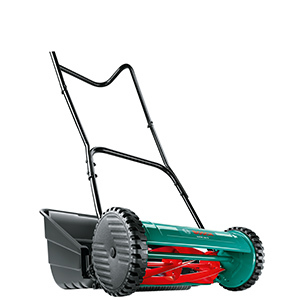 Bosch AHM 38 G Cylinder Lawnmower for a clean, precise cuts is suitable for small lawn areas. 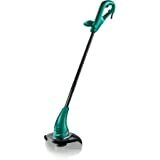 This gives a finish to your lawn as they cut the grass cleanly without ripping it effortlessly. Ideal gadget for a lawn of our size which is just 20sq metres. Exactly as packaged and easy to assemble. You do need to take a bit of time and care on adjusting the height and the blade position for best results. Some of the plastic parts may not stand the test of time which is why I've fallen short of giving this product a 5-star rating. Overall the product is satisfying and is easy to push. It's performance of intended function is pretty spot on. I hope this succinct review helps. Purchase this Bosch after another brand post broke on the handle. I had the delivery arrived within two days, then 15min to setup the mover and then had my lawn moved within 30mins.. I have to say, it was so easy.. 5 out of 5 for me..
3.0 out of 5 starsExercise but that's all. Doesn't cut low enough to be honest. Within a say or so I can already see a bit of rust forming? Should have gone for petrol again. Product arrived on time and works. Some assembly is required. Reasonably easy picture instructions are provided inside the user manual. One multi tool is included in the box, a Phillips head screwdriver will also make the assembly a little easier. This hand powered grass cutter seems to do the job on first impressions. The grass I have given it a test run on was not very long but it did have some parts that were longer than others. Not sure how it will do on very long grass and my lawn is quite small by Australian sizes. The plastic grass catcher that is also part of the package easily fits on the rear and does an ok job of catching. There was some spillage on one side and the grass appeared to be caught more on one side causing the catcher to fill very quickly. This can of course be balanced out in the catcher as you go but it doesn’t hold very much. I’m not sure if it makes any difference but the mower felt easier to push without the catcher attached. As it is powered by you (by pushing) a certain amount of physical exertion is needed, a general level of fitness would also be handy plus you can use it for regular exercise. That’s another way of writing that it’s hard work giving this mower a push around. For general tidying and keeping your lawn trimmed it’s not bad.